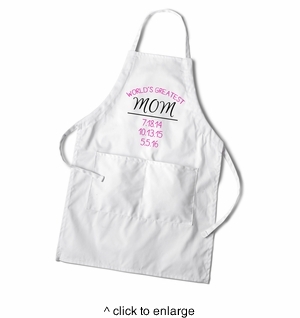 DETAILS: This personalized World's Greatest Mom apron is a perfect gift that special mom in your life. The apron is personalized with 3 Birth Dates and comes in 20 different text colors. MEASUREMENTS: 28 3/4" x 19 1/2"
PERSONALIZATION: 3 Birth Dates, up to 6 digits per date. Choose from 20 text colors.